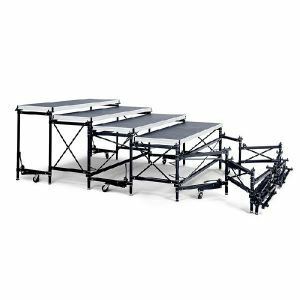 Maximize seating capacity and minimize labor with this portable audience seating riser. Versatility, flexibility, and reliability combine to make the ML-1600 Seating Riser the first choice of theater and facility managers around the world. Versatility, flexibility, and reliability combine to make the ML-1600 Seating Riser the first choice of theater and facility managers around the world. You can seat your spectators in one of several possible configurations using the same components, and maximize seating capacity for each event. Risers contoured to hockey dashers or straddling pillars allow you to increase your seating capacity in difficult areas. The one piece folding support assembly slashes hours off setup time. Just roll it into place and unfold it. The combination of our resonance-absorbing decks and the sturdy ML-1600 understructure helps spectators feel like they are on permanent risers. Simply rolling the multi-level assembly into position and unfolding it in place. An 18-level riser is 54’ extended but only 5 1/2’ stored which saves you storage space. Maximize seating capacity with sections contoured to facility structures such as hockey dashers and pillars. Rely on consistent operation because the few moving parts require no tools, and seldom incur maintenance. Build to unlimited overall width. Configure seating to best suit the event by adding or removing levels. Audiences will appreciate the StageRight deck because it feels more solid under their feet and the composite structure of the deck reduces distracting noise. Save on your initial investment by using the Decks interchangeably on other StageRight support systems (such as Z-800 Multi-Purpose Staging) to facilitate diverse performance requirements. Decks self-align quickly and easily, fastening without tools, clamps or clips. In a single step, placing the decks also aligns and connects the riser bays (sections). Unfold and fold the support assembly smoothly and quietly. Reduce maintenance by eliminating metal-on-metal wear. Reduce setup effort by rolling the support assembly to and from storage and during extension and closure. Move system assembled (if desired). Eliminate movement while in use: the casters retract after the system is positioned, allowing the screw feet to contact the floor and carry the load. Non-marring 5” diameter polyurethane casters with 900 pound load rating.